The Cape Town Gospel Choir is available for corporate functions, weddings and events. 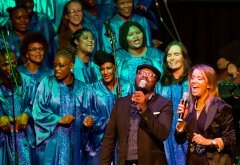 One of the most versatile choirs in the city, the Cape Town Gospel Choir can perform music from traditional African to contemporary American, accompanied by percussion, full band, piano, or orchestral instruments - all the way up to full symphony orchestra if you want it. We are able to supply string and brass groups as well to make your function that little bit extra-special. Whether it's for a large-scale event, or an intimate gathering, background music or feature performance - our adaptable group can help! Due to our busy schedule, we reserve the right to decline events without reason. For more information, or to hire the choir, please contact Colin on 021 975 1329 or 021 813 5853. You can also email us on info@ctgc.org.za for more.